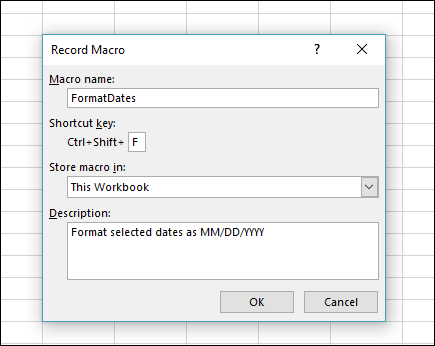 To automate a repetitive task, you can record a macro with the Macro Recorder in Microsoft Excel. Imagine you have dates in random formats and you want to apply a single format to all of them. A macro can do that for you. You can record a macro applying the format you want, and then replay the macro whenever needed. When you record a macro, the macro recorder records all the steps in Visual Basic for Applications (VBA) code. These steps can include typing text or numbers, clicking cells or commands on the ribbon or on menus, formatting cells, rows, or columns, or even importing data from an external source, say, Microsoft Access. Visual Basic Application (VBA) is a subset of the powerful Visual Basic programming language, and is included with most Office applications. Although VBA gives you the ability to automate processes within and between Office applications, it is not necessary to know VBA code or computer programming if the Macro Recorder does what you want. It is important to know that you when you record a macro, the Macro Recorder captures almost every move you make. So if you make a mistake in your sequence, for example, clicking a button that you did not intend to click, the Macro Recorder will record it. The resolution is to re-record the entire sequence, or modify the VBA code itself. This is why whenever you record something, it's best to record a process with which you're highly familiar. The more smoothly you record a sequence, the more efficiently the macro will run when you play it back. Macros and VBA tools can be found on the Developer tab, which is hidden by default, so the first step is to enable it. For more information, see Show the Developer tab. When you record a macro for performing a set of tasks in a range in Excel, the macro will only run on the cells within the range. So if you added an extra row to the range, the macro will not run the process on the new row, but only the cells within the range. If you have planned a long process of tasks to record, plan to have smaller relevant macros instead of having one long macro. It is not necessary that only tasks in Excel can be recorded in a macro. Your macro process can extend to other Office applications, and any other applications that support Visual Basic Application (VBA). For example, you can record a macro where you first update a table in Excel and then open Outlook to email the table to an email address. Follow these steps to record a macro. In the Macro name box, enter a name for the macro. Make the name as descriptive as possible so you can quickly find it if you create more than one macro. Note: The first character of the macro name must be a letter. Subsequent characters can be letters, numbers, or underscore characters. Spaces cannot be used in a macro name; an underscore character works well as a word separator. If you use a macro name that is also a cell reference, you may get an error message that the macro name is not valid. To assign a keyboard shortcut to run the macro, in the Shortcut key box, type any letter (both uppercase or lowercase will work) that you want to use. It is best to use Ctrl + Shift (uppercase) key combinations, because the macro shortcut key will override any equivalent default Excel shortcut key while the workbook that contains the macro is open. For instance, if you use Ctrl+Z (Undo), you will lose the ability to Undo in that Excel instance. In the Store macro in list, select where you want to store the macro. In general, you’ll save your macro in the This Workbook location, but if you want a macro to be available whenever you use Excel, select Personal Macro Workbook . When you select Personal Macro Workbook, Excel creates a hidden personal macro workbook (Personal.xlsb) if it does not already exist, and saves the macro in this workbook. In the Description box, optionally type a brief description of what the macro does. Although the description field is optional, it is recommended you enter one. Also, try to enter a meaningful description with any information that may be useful to you or other users who will be running the macro. If you create a lot of macros, the description can help you quickly identify which macro does what, otherwise you might have to guess. On the Developer tab, in the Code group, click Stop Recording . 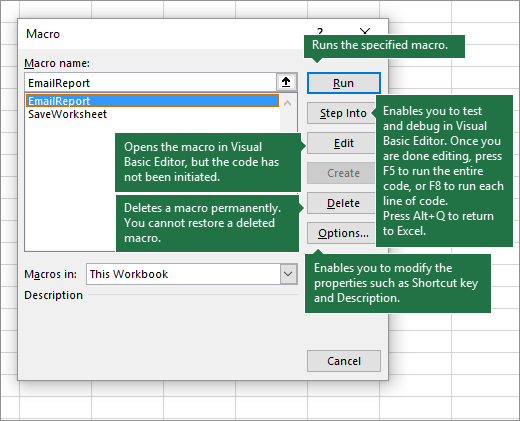 In the Developer tab, click Macros to view macros associated to a workbook. Or press Alt+ F8. This opens the Macro dialog box. Caution: Macros cannot be undone. Before you run a recorded macro for the first time, make sure that you’ve either saved the workbook where you want to run the macro, or better yet work on a copy of the workbook to prevent unwanted changes. If you run a macro and it doesn’t do what you want, you can close the workbook without saving it. Here's further information on working with macros in Excel. Read specific information on available security settings for macros, and their meaning. There are several different ways you can run a macro, such as using a shortcut key, graphic object, Quick Access Toolbar, a button, or even when opening a workbook. You use the Visual Basic Editor to edit the macros attached to a workbook. If a workbook contains a VBA macro that you would like to use elsewhere, you can copy the module that contains that macro to another open workbook by using the Microsoft Visual Basic Editor. On a worksheet, right-click the object, graphic, shape, or the item to which you want to assign an existing macro, and then click Assign Macro. In the Assign Macro box, click the macro that you want to assign. You can assign a macro to a graphic icon, and add it to Quick Access Toolbar, or the ribbon. You can assign macros to forms and ActiveX controls in a worksheet. Learn how to enable or disable macros in Office files. Learn how to find help on Visual Basic elements. You can work with recorded code in the Visual Basic Editor (VBE) and add your own variables, control structures, and other code that the Macro Recorder cannot record. Since the macro recorder captures almost every step you take while recording, you can also clean up any unnecessary recorded code that serves no purpose in the macro. Reviewing your recorded code is a great way to learn or sharpen your VBA programming skills. For more information on modifying recorded code in an example, see Getting Started with VBA in Excel. When you record a macro for performing a set of tasks in a range in Excel, the macro will only run on the cells within the range. So if you added an extra row to the range, the macro will not run the process on the new row, but only the cells within the original range. Macros and VBA tools can be found on the Developer tab, which is hidden by default, so the first step is to enable it. Go to Excel > Preferences… > Ribbon & Toolbar. In the Customize the Ribbon category, in the Main Tabs list, select the Developer check box, and then click Save. On the Developer tab, click Record Macro. In the Macro name box, enter a name for the macro. Make the name as descriptive as possible, so you can quickly find it if you create more than one macro. In general, you’ll save your macro in the This Workbook location, but if you want a macro to be available whenever you use Excel, select Personal Macro Workbook. When you select Personal Macro Workbook, Excel creates a hidden personal macro workbook (PERSONAL.XLSB) if it does not already exist, and saves the macro in this workbook. Workbooks in that folder are opened automatically whenever Excel starts, and any code you have stored in the personal macro workbook will be listed in the Macro dialog, which is explained in the next section. To assign a keyboard shortcut to run the macro, in the Shortcut key box, type any letter (both uppercase or lowercase will work) that you want to use. It is best to use key combinations that don't correspond to existing shortcut keys, as a macro shortcut key will override any equivalent default Excel shortcut key while the workbook that contains the macro is open. Although the description field is optional, it is recommended you enter one. It's helpful to enter a meaningful description with any information that may be useful to you or other users who will be running the macro. If you create a lot of macros, the description can help you quickly identify which macro does what, otherwise you might have to guess. On the Developer tab, click Stop Recording. In the Developer tab, click Macros to view macros associated to a workbook. This opens the Macro dialog box. Note: Macros cannot be undone. Before you run a recorded macro for the first time, make sure that you’ve either saved the workbook where you want to run the macro, or better yet work on a copy of the workbook to prevent unwanted changes. If you run a macro and it doesn’t do what you want, you can close the workbook without saving it. Learn to enable or disable macros in Excel for Mac. To save time on tasks you do often, you can record the steps of those tasks as a macro. Find information on how to create and run a macro. On the Developer tab, click Visual Basic, or click the Tools menu > Macro > Visual Basic Editor….